Filling a large wall space can be intimidating—and expensive. To help with that design conundrum, Terracotta Design Build in Atlanta, Georgia offered to share ideas on how to liven up the walls in your home. 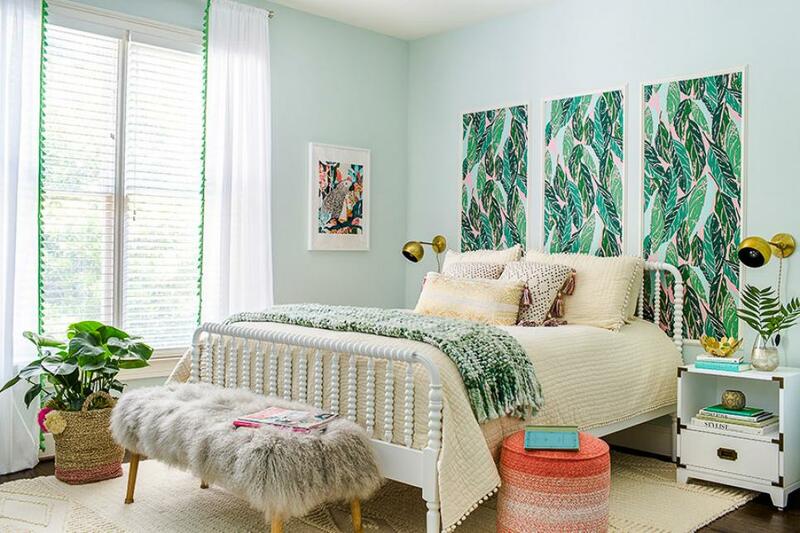 Framed wallpaper panels gave this teen room a tropical vibe and just enough character and interest without committing to a whole wall of wallpaper. This is a good solution for teens, who are known to change their minds often. 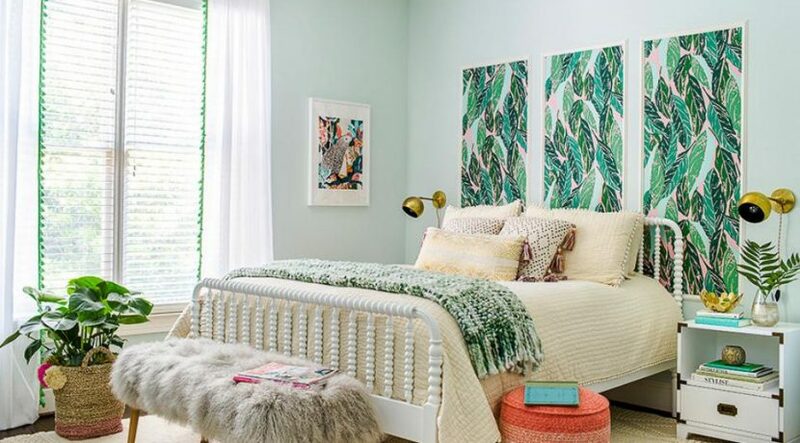 Wallpaper is a great temporary option that will help keep up with ever-changing fashion tastes. A gestalt approach solves so many design dilemmas. A great composition provides a deliberate, organized space to showcase family photos, art or even mirrors. Mixing shapes, sizes and color—composition is key. Hang blue painter’s tape in the shape that best fits the space to design your composition within the boundaries. Tip: This gallery work effect works best visually if you have a lot of white space around your design. Two shelves joined visually by a splash of color become a focal point while strategically providing functional storage/display space in this boy’s room. A simple, large graphic print leaning on a dresser evokes a youthful casualness making a clean, modern statement. A coat of paint will magically tie any wall into a space no matter the texture. A single industrial piece functions as the focal point on the wall. This quirky light fixture has a big presence chosen for its long arms and modern chrome finish. Along with a simple piece of art, this is a fun design trick that also serves a purpose in this space with 12 foot ceilings. A simple paneled frame of trim around this artwork gives it much more of a presence and adds a detailed, finished look to this stairwell defined by high ceilings. Built-ins on walls are perfect for adding fun splashes of print and color. The wallpaper here gives these built-ins more punch and offers an interesting background to show off a collection.